Crabs! For Dewi :) | Goodbye UK, Hello World! I promised I’d post this ages ago. 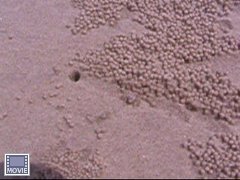 It’s a video of the little teeny crabs on the beach at Hua Hin in Thailand rolling sand into balls. It’s in AVI format and, no, I can’t and won’t convert it to any other format. It’s an 8mb download, or thereabouts. Enjoy! This entry was posted in Animals, Thailand, Video by Mosher. Bookmark the permalink. Hahaha – funny little buggers, aren’t they?